This forum is part of a wider research commissioned by Draft, a year-long project anchored in nine interdisciplinary teams around the world (Bombay, Cairo, Cape Town, Hamburg, Hong Kong, Shanghai, St. Petersburg, Zurich, and Mexico City), which question the conditions of public space, as well as the possibilities of contemporary art to intervene and produce critical debates. “y se me vinieron muchas imágenes” (“and many images came upon me”) is the sentence Marissa Mendoza used to describe the moment when she found, on Facebook, a picture of her husband Julio César Mondragón who was killed and his face ripped off in the brutal attacks on the city of Iguala in Guerrero, Mexico. Going back to that image in order to rethink the events of the last three years, the forum will probe a public space increasingly marked by violence. This accumulation of events and incidents demands that we think not just about them, but rather with them, in order to better understand their connectedness. How do we think about the relation between the public and politics in the context of this situation? How do these images circulate and signify our common spaces? Can we describe politics through these images? How do we think publicly about all this? To that end, the forum will unfold an archive of recent historical landmarks through images, videos and audio. This “Atlas of Glimmers” comprising images, audio, artworks, banners, songs, headlines, and slogans, among other elements, will connect seemingly disparate moments that have all been variously circulated in the media and on social networks. The forum invites different voices to help with this action, in the hope that this polyphony might reveal what has otherwise disappeared under the heap of constant accumulation. In doing so, we intend to open up different ways to think about our present. 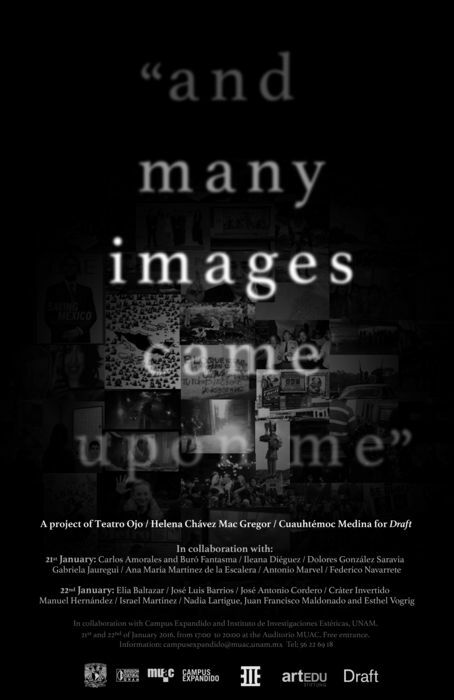 In collaboration with Campus Expandido/MUAC and Institute of Aesthetic Research, UNAM.